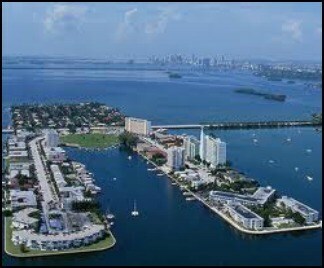 North Bay Village is a community comprised of three small islands in between Miami and Miami Beach. The city has a total area of 0.837 square miles with more than half of that being made up of water. This is a very quiet and peaceful town because of its small size and the fact that the majority of residents are there year round. There is about an equal number of luxury condos and townhomes located in North Bay Village and the town has a prevalent piracy design throughout. Many roads in the neighborhood have names that relate to pirates. The theme fits perfectly with the location surrounded by water. The island location provides spectacular views of Biscayne Bay for residents to enjoy. It is a very residential town with very few retail shops and commercial shopping opportunities. There is also one elementary school located on the island. North Bay Village is a beautiful island community that is still connected to two larger cities that are only minutes away. North Bay Village is connected to Miami and Miami Beach by the John F. Kennedy Causeway, which makes traveling to the mainland and the beach very easy. The area is also close to both major airports and all of the major highways. While North Bay Village has more of a residential feel, it has small mom and pop shops for residents to enjoy and all of the major attractions can be found nearby in Miami, Miami Beach, or Fort Lauderdale. Fine dining and upscale shopping are easily accessible for North Bay Village residents. Recreational activities are available all over ranging from water related activities to playing golf and tennis. The lifestyle experienced in North Bay Village is held to the highest standard of luxury and relaxation.